With over 70 million app downloads and monthly active users, Skyscanner has successfully developed a two-sided marketplace that meets the needs of both travellers and travel suppliers by surfacing a wide range of travel offerings, and providing access to a global marketplace. To date, we have achieved this predominantly through a traditional metasearch model, in which users visiting the app or our website redirect onto the supplier website and book their flight, hotel, or rental car there. Yet over the last year, we have transformed our approach to meta and introduced Direct Booking with the likes of British Airways and Scoot. 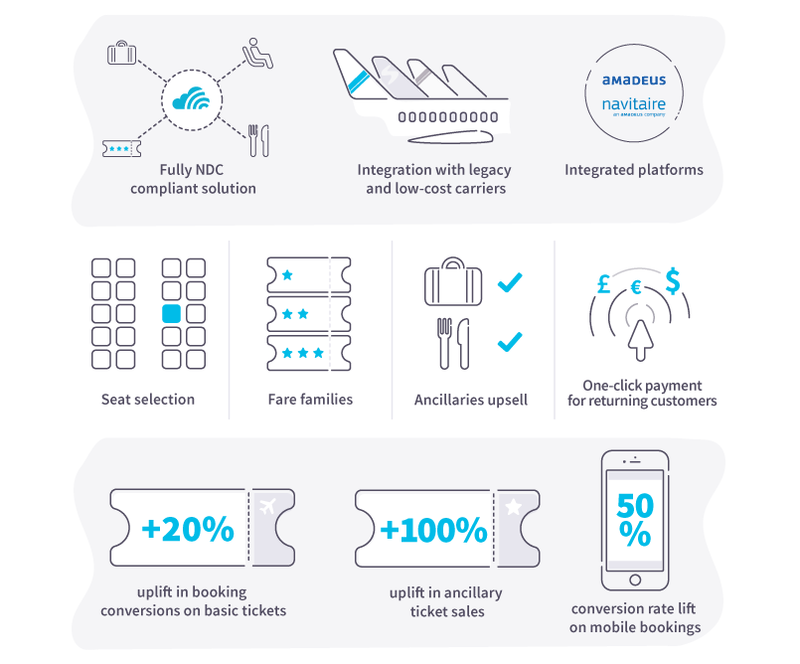 With Direct Booking, suppliers are enabled to showcase their brand and the full range of ancillaries on Skyscanner, whilst retaining ownership of the customer and the payment transaction. They also benefit from the scale and knowledge that we have at Skyscanner around the behaviour and needs of our users. This change was a direct response to the trends that we anticipated and saw emerging across global retail markets; all of which highlighted a need to make transactions more seamless and instantaneous to accommodate digitally reliant and mobile-first travellers. Early adopters of the Direct Booking platform have seen an uplift in booking conversions of +20% on basic tickets and 50% on mobile bookings, along with a +100% uplift in ancillary ticket sales. This highlights the value created for travellers by this alternative approach to meta, particularly on mobile. However, to drive growth, airlines need to consider how they can respond to market trends across a multitude of platforms and channels (not just on Skyscanner). 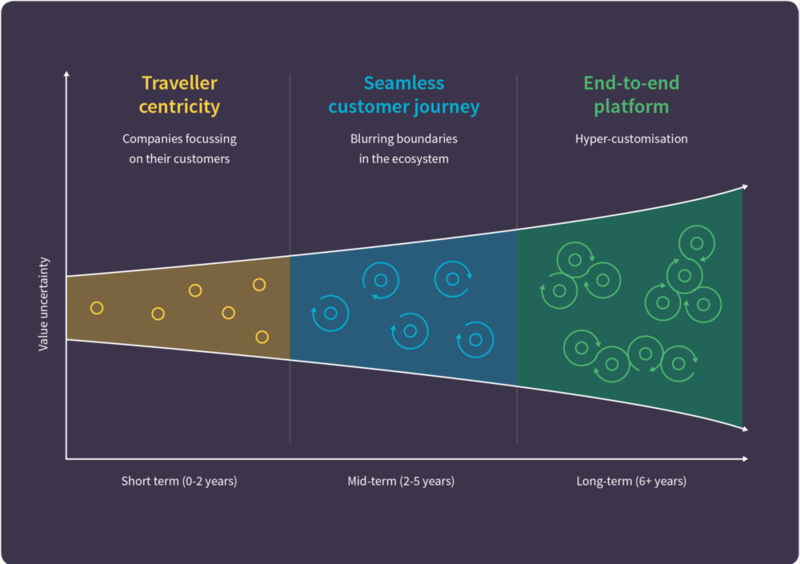 So, we have outlined the five trends that highlight the need for a fresh approach across the travel ecosystem, along with the technologies and mindsets that airlines can adopt to capitalise on the changes ahead as we move towards the future of distribution. Artificial Intelligence (AI) based innovations are already making an impact throughout the travel journey – from the facilitation of smarter suggestions in search and booking, to the introduction of digital concierges that can answer your questions in-destination. At Dubai International Airport, security has even been upgraded using AI; with cameras embedded in a virtual aquarium, travellers can be scanned, identified and on their way in a much more enjoyable manner. Ultimately, what all AI innovations respond to is the traveller's desire for more convenience and greater efficiency. Almost a third (29%) of global travellers say they are comfortable letting a computer plan an upcoming trip based on data from their previous travel history and half (50%) don’t mind if they deal with a real person or computer, so long as any questions are answered. 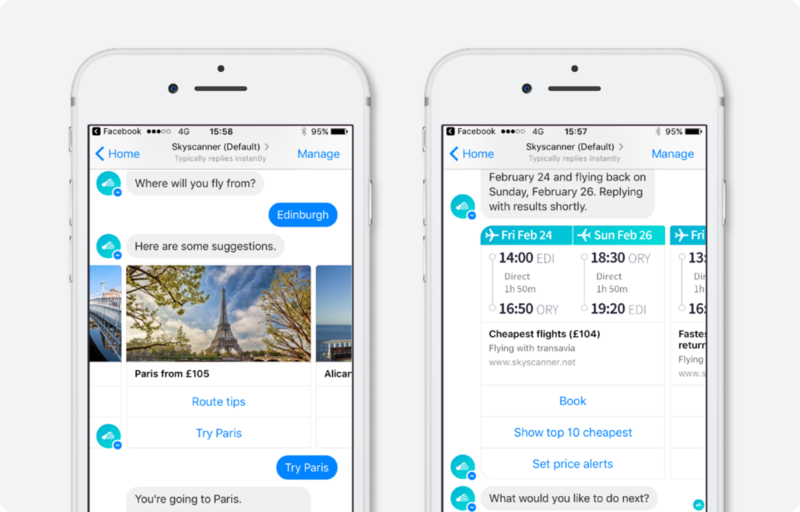 At Skyscanner, we have witnessed the migration of travellers from the click-type-tap patterns that are common in apps and sites, to a more conversational format in which they ask casual, but fully-loaded questions. This has driven us to create chat interfaces across Facebook Messenger, Amazon Alexa, Microsoft Cortana and Skype that have more than one million unique interactions to date; and encouraged us to enable others to do the same through knowledge sharing and our API offerings. For airlines, this has a few implications. Naturally, considerations must be made about how to leverage these new channels and respond to the change in customer behaviour and expectations – particularly around customer service enquiries. For example, how do you handle the assumption that travellers will be able to ask you questions and raise issues 24/7 using Facebook Messenger? 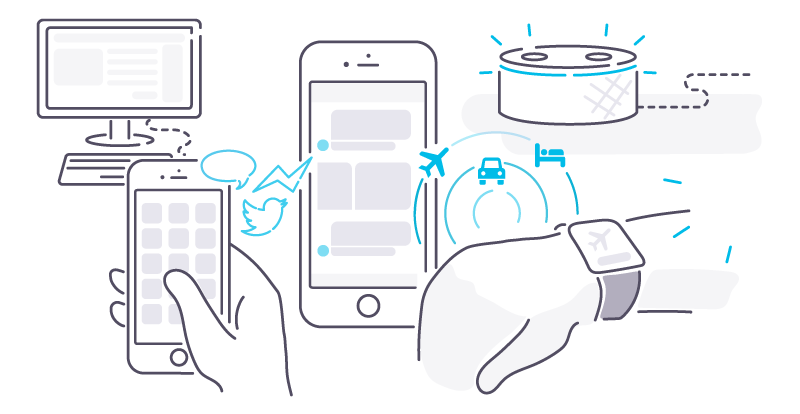 Similarly, airlines must ensure they have a brand presence on any new platform in which their audience wants to interact with their brand; whether that's on Alexa, or via a Skype Bot. Most importantly though, airlines need to consider how to operate and differentiate their offering in a brand-agnostic environment. In the world where individuals are asking “Hey, Alexa, where can I go for $200? ", how will you stand out? As the travel ecosystem becomes more complex and intertwined, and it becomes more challenging to attract and retain customers, companies need to find new ways to differentiate themselves and garner loyalty. With relevant recommendations expected to expand revenue per passenger by 20% in 2025, the effective implementation of personalisation will determine the travel businesses of the future. The in-depth analysis of big data and real-time analysis acts as a great starting point from which to develop a unique journey for your customers and deliver value across the travel cycle. However, in the ultra-competitive travel landscape, success takes more than being data driven. Companies will need to reach new levels of personalisation through increased customer interaction, and better connections and collaboration with others inside and outside the travel ecosystem. This includes connecting with new distribution channels and technologies, such as voice and chat bots. For airlines this presents a challenge – as many are built on legacy systems with de-centralised data – but also a great opportunity. Although migrating towards a centralised system that enables big data, real-time analysis and connectivity can seem arduous, once this is in place you can capitalise on this data and the insights it provides. From dynamic and highly personalised email campaigns, to optimising in-flight offers based on previous traveller purchases and preferences, the opportunities to enhance profitability and improve loyalty really are endless. China, and other major economies in South-East Asia, are set to play a major role in influencing the future of distribution. With 43% of bookings in China completed on a mobile device, these markets are well ahead of the curve and setting trends across the digital economy that later diffuse into global markets. So, whilst these markets are unique in their pace of change and delivery, the trends experienced in China and other parts of South-East Asia will translate over time, making learning from businesses in these markets invaluable. There are two companies in the Chinese market that have captured our attention at Skyscanner and set standards for ecommerce retailers, and travel companies, which airlines should be looking to emulate. Alibaba’s Tmall is an ecommerce business which has amassed over 488 million active buyers. Its captive audience demonstrates that its supplier-brand led approach, in which each company has a “store”, has delivered value to Chinese online shoppers whilst also benefiting suppliers. With space and ability to control the display of their products and an abundance of up-sell opportunities built-in, brands can build loyalty and retention whilst tapping into the size of Tmall’s user base. WeChat, a dominant messaging app, has adopted a similar approach. Users can browse the integrated WeChat stores of their favourite brands and make a purchase with one click. In addition, a large portion of WeChat users are also engaging in social shopping on the Chinese messaging platform; sharing links to products and discounts. This highlights the need to not only give brands their own space, but to also find ways to enable purchases through new, more social, means of distribution. Evidently, brands looking to compete in China are expected to be present and available in a multitude of formats; through the storefronts of ecommerce companies such as Tmall, and in messaging apps such as WeChat. The implication being that all businesses, including airlines, need to consider how they represent and differentiate their brand across platforms. With the number of platforms and technologies growing at scale, airlines also need to consider connectivity. Developing a solution for each platform will not be sustainable or scalable going forward – and companies that take a platform by platform approach will be slower to market and burdened by high investment costs when seeking to innovate. Re-architecting your business is critical to being successful in the future of distribution. Although voice, bots, and other AI based technologies have stolen the spotlight, mobile remains the distribution channel with the fastest growth – with 54% of travel bookings now made in-app and 70% of all travel bookings forecast to be mobile by 2020. However, not all airlines are prioritising the optimisation of their mobile proposition. With changes such as push notifications driving a 9% increase in conversion rate, investment needs to be made to improve the search and booking process, using data and analytics to respond to the needs of digitally dependent travellers. This includes finding ways to interact with consumers through the channels they use every day, like messaging, instead of forcing them to open a different app every time they want to do something. This digitisation in aviation, travel and tourism is expected to create up to $305 billion in value between 2016 and 2025 throughout the ecosystem. Additionally, $100 billion of value is expected to be transferred from traditional players to new competitors over the next few years. To get a slice of this high value pie, companies throughout the travel sector need to embrace digital innovation – or risk being left behind. With many airlines still trying to improve their experience on-site, it will be another few years before apps are meeting the needs of mobile-first travellers across the board. And it may be even longer before airlines focus on distributing across the ecosystem of the traveller rather than directly via their website. To make progress, airlines will have to make technological investments – and more importantly, they need to overcome their fear of losing the direct ownership and relationship with the customer. Only by shifting their perception of indirect channels and platforms can airlines hope to dominate in the future of distribution. The payment process is a critical contributor to performance for travel suppliers and retailers alike. It is fundamental to converting users from browsing to booking and failing to optimise payment solutions can damage performance in the short-term and hinder the potential for companies to maximise customer lifetime value. Whilst the causes of poor payment performance can be resolved in most cases, businesses across the travel ecosystem have only just begun making improvements to their payment solutions. They have some way to go before meeting the expectations of digitally minded travellers who are familiar with the likes of Amazon and Airbnb. With the continued growth of mobile, and the rise of eWallets which are forecast to account for 46% of global transactions by 2021, it is evident that maintaining the status quo is insufficient for travel companies looking to compete with mobile-oriented disruptors. Airlines seeking to serve the needs of today's users need to re-assess their payment process and seek to reduce friction. This will deliver benefits not just at the initial point of booking, but also when seeking to capitalise on up-sell and cross-sell opportunities; from seat reservations ahead of the flight, to meal purchases during it. With Wi-Fi in place on a growing number of planes, in-flight shopping could also benefit from advancements in payments. The airlines that gain the most will be those that transform their payment process from a pain point to a feature and use it as a differentiating factor; enabling travellers to purchase, change their flight, or take-up an upgrade offer with the tap of a screen. Transformation and trends in the travel sector are all about increasing speed and creating agility to spot and respond to the needs of customers even before they recognise what they want. Companies need to be equipped with infrastructure that enables efficiency, and the delivery of personalised experiences based on real-time data. Progression towards this will take place in phases, as outlined in the following diagram. And the progression from traveller-centricity to end-to-end propositions requires the recognition and implementation of four transformative mindsets and technologies. With an ever-growing number of travel businesses, there is increasing fragmentation – driving users to have to open a new website or app for every aspect of their travel journey. This not only makes searching and booking challenging for travellers, but it also restricts the scope of brands and their ability to enter new markets. This limits the opportunity for business growth on every level. To combat this, businesses need to be open to new distribution methods and a wider set of connections. This includes integrating with technologies and platforms which bring them into the daily lives of consumers and enable them to engage with individuals in ways that add value to both the business and the user – such as Facebook Messenger or Alexa. A key issue for travel businesses looking to deliver at pace are the legacy systems on which many of them operate. The objective of NDC is to unify the information ecosphere that blocks innovation and progression in the travel ecosystem: bringing commonality, simplicity and lower barriers to entry. NDC also takes travel content distribution to the next level, modernising the way products can be sold by travel agents, corporations and beyond. With its retail-focussed approach to distribution it is designed to meet traveller needs, and enables businesses to showcase ancillaries and innovate at scale. With NDC in place, businesses can also capitalise on the emergence of new distribution channels without the need to develop a compatible API for connectivity. Given the trend towards both personalisation and more conversational interactions between brands and individuals, both AI and Machine Learning are primed to bring the next wave of disruption (following on from mobile). Capitalising on these technologies will empower businesses to deliver seamless solutions designed to meet the needs of travellers throughout the search and booking journey; and facilitate personalisation to generate more value. Taking steps towards leveraging these technologies will be no easy feat; particularly for businesses built on legacy IT structures. So, it is worth considering how sharing models can be used to reduce the upfront investment required and enable airlines to benefit from the experiences and learnings of experts in technologies such as bots. This approach will become even easier as systems become more interoperable; particularly as NDC becomes more widely adopted. With new trends, technologies, and innovations constantly emerging, it is critical to lookout for inspiration at all times; particularly from the East, and more specifically China, where behaviours often foreshadow where the rest of the world will be in the next 10 to 15 years (or more). Technology also advances at a faster rate in the markets of the East, so the capabilities that are being developed today can give your business a chance to prepare itself for the disruptions – and opportunities – that are to come. At Skyscanner we have looked at what we can learn from some of the Chinese apps. Jing Dong, for example, is used to purchase larger electronic products and has generated trust through excellent customer service (in-app chat) and fast refunds. TaoBao, another retailing app, is differentiated by its picture search function. By pressing the camera, you can take or upload images and highlight the parts of the image you would like the algorithm to search for. Its speed and accuracy also distinguishes it from apps offering similar features. These apps, and others, have implications for our features and design as we look to the future. Are we where the traveller is? How are travellers using technology to plan trips? Are we delivering solutions aligned with the digitally-dependent and mobile-first traveller? How do we stand out in a world that includes both brand-centric and brand-agnostic channels? Are we continuing to learn from other businesses – not just airlines – and thinking globally? Are we considering how we enhance engagement and retention, not just revenue? Partnering with companies such as Skyscanner will also benefit airlines and others in the travel ecosystem seeking to leverage our expertise around mobile and bot technology, as well as the data captured on the behaviour of our 70+ million monthly visitors.